At the start of this generation, the Madden NFL series was in quite the predicament. Everyone had seen the incredible looking trailer showing what looked to be both a great visual & gameplay experience. What we received in Madden NFL 06 was far from that, unfortunately. As we approach the release of Madden NFL 25, the last game before the new generation starts, it’s comforting to see that we’re in a far better place. With such a poor start for the series on this group of consoles, can Madden NFL 25 close out the generation with a game to make up for it? The biggest feature to the game this year, and returning after quite the hiatus from the series, is Owner Mode. While players are still able to play the game as either a player or a coach on a team, they’re now able to take it a step further and manage the financial aspect. From adjusting the prices of the hot dogs to turning on your city and moving them to a new location, there’s a great bit of depth here. As an owner, you’re going to be constantly measured against every other team as you try to build the biggest empire in the NFL. All of your duties as a coach are still available, which leaves Owner Mode feeling closer to “God mode” in Madden NFL 25. Some of the more attractive features in the mode relate to renovating and rebuilding your stadium, or completely relocating your franchise. By partaking in one of these actions you’ll be presented with plans that take place in stages. Nothing is instant, and money comes out of our budget in a realistic manner. It has a SimCity feel to it at times, mostly due to the fact that you have advisers to help you along the way. If you choose to relocate a team, you’re presented with tasks every few weeks related to that decision. You’re able to relocate your franchise to an approved list of cities that the NFL chose as realistic destinations for franchises. Each city has its own list of team names that falls in line with their culture or history. Once you’ve chosen a team name, you’re able to choose between three different jersey styles. Each decision that you make will ultimately have an approval percentage from your fan base, so it’s important to weigh that as well. One of the largest decisions you’ll make will be what your stadium actually looks like. You have a few options at your disposal, but paying for a more futuristic stadium will definitely cost quite a bit. Depending on which city you’ve chosen, however, you may receive a portion of funding. Going with a smaller destination will harm you here as you’ll be responsible for footing much of the bill for your new stadium. Previous versions of Owner Mode had the ability to add in giant scoreboards and customize your stadium in more detail. Having the option to hold promotions for fan giveaways, negotiate marketing deals to bring in more fans, customizing the appearance in more detail, or even getting down to the locker room options would have been nice touches. Owner Mode offers a lot of depth for the first year that it’s back, but you can’t help but hope that we see the mode expanded in future years. Once you’re on the field, you’ll notice gameplay that has the potential to be some of the best we’ve seen for the series. Unfortunately, the more of the gameplay you experience, you’ll begin to notice that the game needs a tuning update to tighten things up. Features like the Run Free aspect are incredibly fun to play, but feel overpowered. Even the mid-tier running backs can juke nearly every defender out of their shoes. The true frustration kicks in when you see a player like Tavon Austin truck a defender the size of Patrick Willis, despite momentum being on the defender’s side. On the defensive side of the ball you’ll find that the computer takes control of the defender you’re using in certain situations. While this type of defensive assist is meant to help the player, it’s used against you more times than not. As you approach an offensive player in certain situations, you’ll often come up short of making the tackle. Whiffs will be rather common for veterans of the series, and offensive players will snake around corners as well. It’s one of a few small concerns in the gameplay, but after spending a decent amount of time with the game it can be compensated for in time. While there are small gripes riddled throughout the game, the gameplay does feel more accessible than recent years. Run Free allows players to pull off an incredible amount of moves which lead to some of the best highlights fans will have for years. The read option has been toned down significantly from NCAA Football 14, but powerful blocking from receivers still makes it an easy first down for experienced players. While the blocking is probably the best we’ve seen in this generation of consoles, there’s still tuning that needs to happen. While lineman are mostly fine, when a defender engages with a running back or receiver it’s near impossible to shake them loose despite of their ratings. 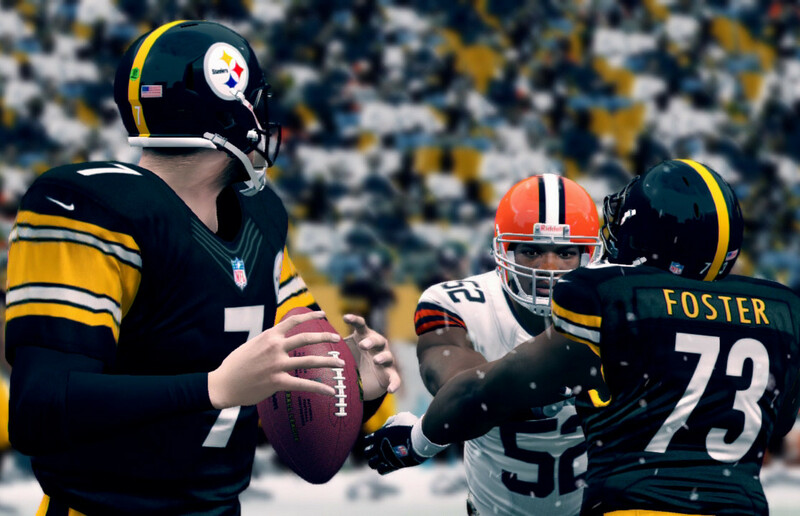 All in all, Madden NFL 25 offers the the most impressive replay value in a long time. Ultimate Team’s addition of a seasons aspect will be a huge hit, and the ability to have multiple lineups and the introduction of chemistry will go a long way. The Madden series finally feels like its turning the corner, despite a few missteps, much like the FIFA series a few years back. As the franchise looks to take its next step into next-gen later this year, fans of Madden can at least feel comfortable that current-gen will go out on top.